Undaunted, Renato Dupke and colleagues from the University of Michigan, Ann Arbor, have used ESA�s XMM-Newton and NASA�s Chandra orbiting X-ray observatories, to disentangle the puzzling galaxy cluster, Abell 576. Previous X-ray observations had hinted that the gas was not moving uniformly across the cluster. Using the superior sensitivity and spectral resolution of XMM-Newton and Chandra�s high spatial resolution, Dupke took readings from two locations in the cluster and saw that there was a distinct difference in the velocity of the gas. One part of the cluster seemed to be moving away from us faster than the other. The puzzle was that the moving gas itself was cold by astronomical standards. If this gas moved at such high speeds, it should have had a temperature of more than double the measured 50 million degrees Celsius. 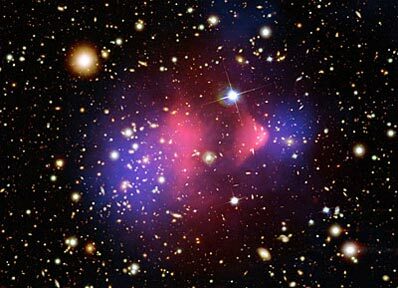 �The only explanation was to take the Bullet Cluster and turn it in the line of sight, such that one galaxy cluster is directly behind the other� says Dupke. Dupke realised that Abell 576 is also a collision, but seen head on, so one cluster is now almost directly behind the other. The �cold� clouds of gas are the cores of each cluster, which have survived the initial collision but will eventually fall back together to become one. Nevertheless, the Bullet Cluster is estimated to have a collision speed similar to the Abell 576 system. �There is now a growing body of evidence that these high collision velocities are possible,� says Dupke. The job of explaining these high speeds now rests with the cosmologists.